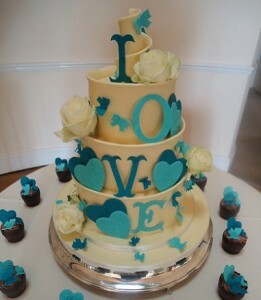 Bespoke Wedding contemporary cakes made in Cheltenham, Gloucestershire and the Cotwolds. You can be assured of being presented with a stunning wedding cake when you commission us to create your wedding cake. You choose the design to fit your dreams and we will deliver the cake to your wedding venue. “Hi Xavier, sorry for the delay..
Just wanted to send you a massive thank you for our beautiful cake.. It was even better than I had imagined.